We have some rather stunning and almost unbelievable news that we need to report. 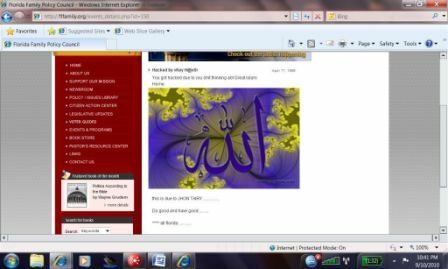 Late last week, we were attacked and the code of our FFPC website at FLFamily.org was completely disabled and destroyed by a radical Muslim hacker. Last Monday, the lawyer who represented Rifqa’s parents in Ohio – who claims to be a “Muslim scholar” – filed a $10 million lawsuit against me personally in Federal Court alleging “emotional distress” and “damage to reputation” for my some of my comments on one of the Fox News interviews. This same lawyer has filed multiple grievances against me with the Florida Bar, trying to have me disbarred or disciplined as an attorney. In addition to all of this, last Friday a Muslim hacker somehow gained access to our FFPC website, (it appears through the server or some older code) and disabled the entire back-end controls on the site, erased most of the code, disabled the blog and left an obscene message on the events page explaining in broken English who he was and why he was hacking the site. Our web experts tell us that the seven-year-old site, which has served us well, is completely unusable and needs to be replaced. Praying for you all – keep up the good fight!